Make an enchanting indoor planter! Limited to 30 participants. Sign up online here, by phone, or in person. 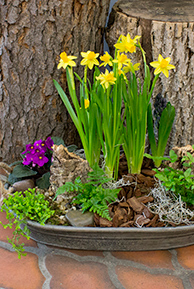 We'll create a mixed garden of green and blooming plants such as ferns, African violets, and bulb plants to bring Spring into your home, planted in a wonderful rustic galvanized metal tray with rope handles. Container measures 17"L x 11.5"W x 2.5"H, perfect to display on a coffee table or even a large farmhouse-style dining table. A sample of the actual design is shown. Class is held Saturday afternoon, February 23 from 2:00-3:30pm at Viviano Flower Shop, 32050 Harper Ave., St. Clair Shores, MI 48082. Please arrive early for registration completion if not already paid in full. Workshop fee: $60, payable in full; or reserve your place with a $10 deposit and pay the $50 remainder upon arrival. Hands-on guidance and all materials are provided. Hold your place by registering with a $10 deposit or full payment 1) here on this Event page, 2) by phone: (800)VIVIANO (848-4266), or 3) at any of our 5 stores. And yes, you're welcome to bring a friend or child! One make and take project is provided per paid registration; they are welcome to share yours at no extra charge.